Lawrence “Lawni” Hamilton was featured in the Style section in the Boston Globe as the “Dapper Hairdresser… Undaunted by his days spent wielding scissors and hair straighteners.” His strong instinct for new trends in hair and fashion drive a constant desire to take his skills to the next level. Lawrence believes that personal expression through hair cut and color plays a huge part in an individual’s overall style and attitude. And if you’re not quite sure what looks good on you yet, Lawni will help you figure it out. With training in the Tony&Guy techniques, and 17+ years of experience in the industry, Lawni has fine tuned his skills. He takes pride in knowing his clients and making custom recommendations based on each individual’s features, hair type, and personality. Some of his esteemed clients include Aretha Franklin (Queen of Soul), Lawrence Stallings (Broadway Actor), Olivia Culpo (Miss Universe 2012), Sonjia Williams (Project Runway/Allstars), and Ashley Feldman (Total Patriots). Most recent updates on INSTAGRAM. 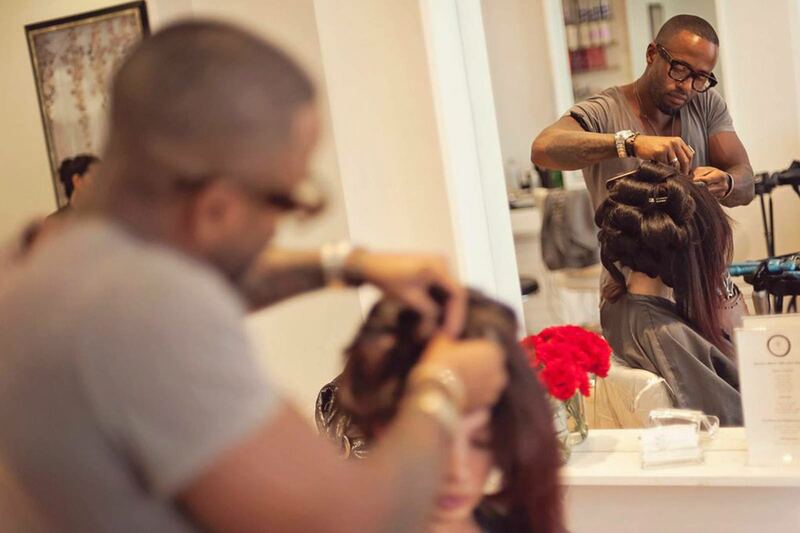 Call or Email Studio 9 (121 Newbury Street) and make an appointment with Lawrence Hamilton today.